I seem to be in a perpetual state of stall with this camera. Odd, because I can’t wait to have it working. Ah, well. Yesterday I bought some hardware bits to complete a tripod base plate for a client. While there, I bought a new #36 drill bit for my #6-32 tap, and a couple of 3/8″ #6-32 brass bolts. The rear box of the camera has been refinished and hardware reinstalled; all that was left was to drill and tap the side rivets and remount the box. I always get stuck mentally on this step for some reason. So, today, I spent a grand total of 15 minutes doing the metalwork. 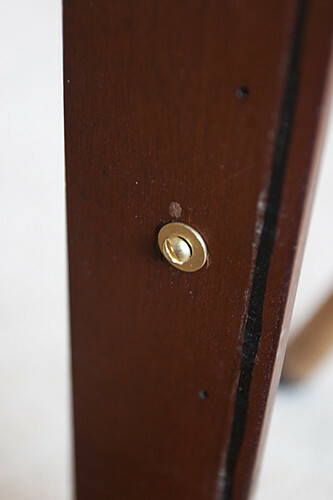 Cut the remaining shafts off the rivets with a Dremel cut-off tool. Drilled carefully into the rivet heads. Tapped with the #6-32 tap. Installed the box. Perfect fit. The rear standard is very nearly done. A change of direction on this rehab: I’m not polishing all the brass after all. Most of what I’d done before has aged in the interim; I’m not mentally in the same place about it anymore. Blame it on the 10×12. I just wanna shoot this, and the patina looks good. 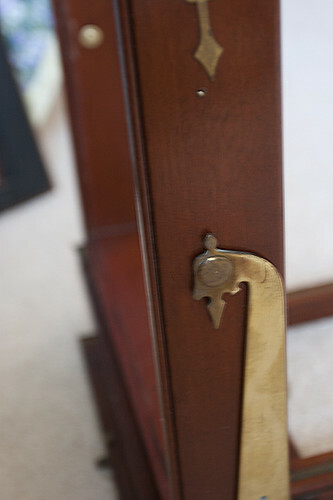 That said, I have a couple pieces on the rear box (the latch and the handle clips) that are very gross. It may only take a soak in Tarn-X to clean them up, but when they’re clean, the rear is done. Front standard is dusty, but otherwise in good shape. So, here’s the plan: I need to fabricate a new front bellows frame, then send the frames off to Sandeha so he can start fabricating the new bellows. I need to make a new rear extension bed. I have the gear racks, which (on closer examination) are a different tooth count, but same pitch, as the existing. I’ve run the pinions over the rack over and over, and they appear to work. I’m going for it. When I confirm that it’s working, Sandeha will start the bellows, which will draw about 27″ total. New handle and lensboards, and install the bellows when they get here. Finally, this camera is moving forward. 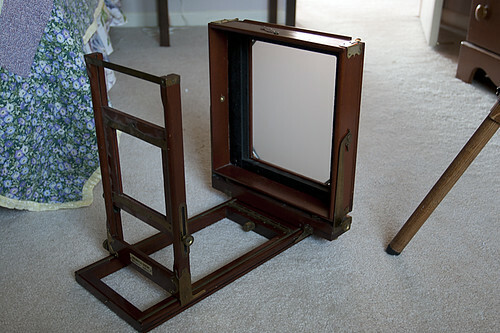 Of course, this is all on immediate hold, until I complete the tripod base plate for the client. Time to get busy. This entry was posted in Large Format, Rehabilitation, Repairs and Rehabs, Seneca View 8x10 by scottperryphoto. Bookmark the permalink.